I’m not going to lie; I’m a tad confused as to which way to go with this release. On the one hand, I’m a big Kadavar fan. I think they’re great. With their huge, strident riffs, enviable beards, the truly organic feel to their retro, hook-laden, twanging hard rock and Christoph ‘Lupus’ Lindemann’s both stellar vocal and mutton chops, it’s hard not to like this German trio’s penchant for their boogie jams and their refusal to shave. The Berliners have already proven that they can succeed in the ever-crowded heavy rock market with their heavy touring cycles and I really do have a lot of time for Kadavar and Abra Kadavar, the band’s two full-length releases to-date. Stick on the live album recorded in the band’s last European tour and whilst you won’t be disappointed with this Germanic blend of blues-edged psychedelia, deliciously crafted riffgasms and sparklingly melodic swing, you’ll also probably wonder why you really need this alongside the two studio efforts. Sure, the band themselves comment “We have always considered ourselves as an absolute live band. Our sound on stage is different from the one on the studio albums and thus we’ve been asked time and again, why we don’t do a live release” but with virtually the entirety of both records’ good tracks jammed out with pretty much the same arrangements it’s hard to make a case to fork out the excess. There’s very little in the way of crowd banter here, no Easter egg bonus features, minimal background gig atmosphere and a decent, but yet not spectacular production quality. Songs-wise, you do get the entire eponymous debut jammed out with rigour and finesse but yet only the galloping Eye of the Storm, a punchy Come Back Life and the triumphant Doomsday Machine make the cut from the newer Abra Kadavar record. Hence I guess if you don’t yet own the self-titled, you could make a case for owning this as one-size fits all Kadavar purchase, but really I’d personally prefer the full production versions of both records. Yes, perhaps Tiger’s drums are slightly more at ease within the free n’ easy live arena and Dragon’s bass sure does sound good from its lofty position in the mix, but don’t forget that this was still a relatively new band plying their trade predominantly to crowds who were seeing them for the first time, so you get the songs rather than any alter-egos here. All Our Thoughts remains a solid opener, it’s gentle, yet groove-injecting pace is a superb entry point to Kadavar’s excellence at sounding old-school yet trend-setting all at once. The hypnotic enchantment of Purple Sage is a well-received kaleidoscope of feedback and cosmic radiation whilst on the flip side, Creature Of The Demon provides all the glorious fills and hippy wig-out choruses your little stoner heart should desire. Closing out with Goddess Of Dawn and Forgotten Past, both progressive car-crashes of Blues Cheer-esque bassy crunch and Hawkwind’s mighty, ground-shattering feedback, is enough to send the Belgian mob home happy by the sounds of things and I’ve no doubt in my mind that this would have been a great live atmosphere filled with beer, sweat, hair and electricity. 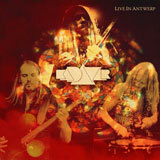 Kadavar are a great live band and Live In Antwerp is a noble testament to that fact. However I can’t pretend that if you’re a true convert to the band who already owns both records that you need to go out and track this down too; you already have all you need with Abra Kadavar and the self-titled. Still, why not grab a t-shirt instead? Or a beer? Or just wait for the next album? This is certainly good but certainly not essential.